Today, on Earth Day 2019, we celebrate our planet and the life of our planet. Where I live we are celebrating spring too—rebirth, the blossoming of trees, flowers, migrating of birds, insects, and the emergence of animals who hibernate or stay under cover in the cold of winter. At the same time as we celebrate, we worry about our home planet—about icecaps melting, dangerous storms, animals and insects going extinct because their climate is threatened. Earth Day reminds us to be active, to have a voice, to do everything we can to keep our planet healthy and alive. A small part of being active is for us to look around and appreciate what it is that we have. The crabapple tree is now in full bloom in many parts of the eastern United States. It deserves our appreciation—the crabapple provides us with sensory delights—beautiful and fragrant blossoms of pink, red, and white, dark green leaves that turn to brilliant reds and purples in autumn along with little somewhat bitter fruits that feed birds and small animals. Although bitter, the small fruits are full of pectin, so some people do make jellies or thicken their jellies with them. Crabapples or Malus are in the family Rosaceae, a family that includes roses, pears, peaches, cherries, apricots, and both strawberries and raspberries. Plants in the Rosaceae family usually have five flowers with five petals and red stamens that produce pollen. Crabapples are pollinated by insects and especially by bees. In fact, a gardener in an orchard in Oregon says that he plants crabapple trees among the apple trees because the crabapples are irresistible to bees and therefore help to pollinate the other apple trees as well. The hardy crabapple is often used as rootstock for grafting other apple varieties too. When I took a class in drawing crabapples (including the one in this blog entry) at the New York Botanical Garden, I discovered that my teacher, Robin Jess, had had crabapple blossoms as her wedding bouquet. That makes romantic sense because crabapples have long been associated with love and marriage. Apples are symbols of fruitfulness and even in some mythology serve as a means to immortality and perhaps the immortality of love. Supposedly if you throw the crabapple pips into the fire while saying the name of your love and the love is true, the pips explode. Let us appreciate the crabapple as an emblem of our appreciation of our planet and let our commitment explode in our work in keeping it healthy and alive. A history changing piece of news from January 9, 2019 brings me back to my blog after many months. Here we are in the twenty first century, and we are finding out surprising details about a woman artist who, according to radiocarbon dating, lived and died in a women’s monastery in Germany somewhere between 997 and 1162 CE in the tenth century. Researchers from the Max Planck Institute for the Science of Human History looking into the health and diets of people in the Middle Ages were closely examining bones of corpses buried in a medieval cemetery in Dalheim, Germany when they discovered something very surprising: a woman with dental plaque that was flecked with hundreds of tiny, bright blue particles barely visible to the naked eye. And here is where twenty-first century technology comes into the story. Multiple spectrographic analyses of the dental calculus or plaque of this German nun’s teeth revealed that the blue flecks were in fact ultramarine pigment, a rare and very expensive pigment made from crushed lapis lazuli stones. Lapis lazuli at that time was mined from a single part of Afghanistan and was as expensive as gold. Only the finest artists used it. It is said that Michelangelo could not afford it, so rare and costly was the mineral. Yet this nameless nun in a women’s monastery was using the ultramarine pigment made from lapis to create art for an illuminated sacred book. I can imagine her sitting on a high stool, vellum page in front of her, and as her mind wandered, raising her brush with its bright blue beauty to her mouth looking at what she was drawing and thinking, maybe even praying. I thought of her as I made my two strokes of ultramarine. My ultramarine is affordable to almost any artist. I use at the top Daniel Smith's Ultramarine Blue and below Winsor & Newton's French Ultramarine both synthetically produced. Unlike Umberto Eco's The Name of the Rose in which monks die from licking poison in their work as scribes, this unknown nun died of natural causes when she was 45-60 years old. The researchers believe that "she was herself painting with the pigment and licking the end of the brush..." https://www.bbc.com/news/science-environment-46783610 The senior researcher in the team, Dr. Christina Warriner, said that dental plaque “is really cool, it is the only part of your body that fossilizes while you are still alive…it incorporates all sorts of debris from your life, so bits of food become trapped, it ends up being a bit of a time capsule of your life.” So think about that when you floss each day. 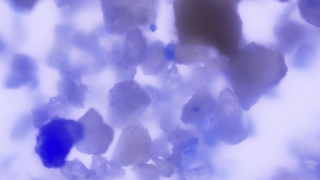 Magnified view of lapis lazuli particles embedded in medieval dental calculus. The teeth of this unknown nun change history in that they make the case that in medieval times women were artists and artists of such great ability that they were using the finest and most costly pigments in their work on illuminations of sacred texts. History tells us that women rarely signed their names to their works as an act of humility, and as a result, women were essentially rendered invisible. The findings in Dalheim may shine a light and make visible at least one of those invisible women. 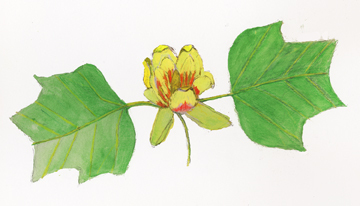 June days in all their glory bring a new pleasure—the tulip tree flower. The tulip or tulip poplar tree, Linodendron tulipfera, is a giant tree that often grows to more than 100 feet tall. 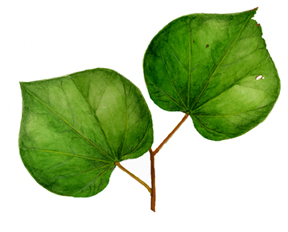 Although it is called a poplar, it is in fact in the magnolia family. It is a fast-growing hard wood tree with wood that can be used for furniture, flooring, and even house building and siding. I was delighted to come across one of these giants in Riverside Park near 79thstreet. I bent my head back and saw that it was filled with flowers—the flowers range from yellow to light green with orange segments in the middle as you can see in my drawing above. Flowers first appear when the tree is a pre-teen or young teen of somewhere between ten and fifteen years of age. It can be hard to see the flowers because they are up quite high, but it is a real treat to come across them. There is a large stand of close to twenty huge tulip trees in the walkway leading to the LuEsther T. Mertz Library at the New York Botanical Garden-- by the way one of the world’s biggest botanical libraries and worth a visit for its amazing holdings and the tulip trees that line the way to it. After the trees bloom, many of the flowers drop and can be found on the ground and looked at in more detail. The tree actually gets its name because of the resemblance between tulip flowers and tulip tree flowers. The flowers produce about a tablespoon of nectar per flower. Bees love the nectar and beekeepers love the poplar honey that is produced—strong tasting, healthy, and delicious. The flowers have also been made into an ointment to treat burns and other skin ailments. The bark of the tulip tree at one time was thought to have a medicinal value as well. The bark was boiled in water and the tea produced was used to treat typhoid and malaria as an alternative to quinine. The inner bark was used to treat rheumatism and arthritis as was the bark from some of the other trees in the magnolia family. As far as we know, the oldest living tulip tree, the Queens Giant, is in Alley Pond Park in Bayside, Queens, New York. The tree is thought to be between 400 and 450 years old and it is over 134 feet tall with a girth of 18.6 feet. Even though it is huge, it may not be easy to find and that is purposeful. Former Parks Commisoner Adrian Benepe said, “There is something to be said leaving it in a bit of obscurity. It’s part of the reason it has survived this long. If everyone is attracted to it, it increases the chance of something bad happening to it.” If you happen to come upon it, you will see a sign that says: “It was standing tall when General George Washington passed close by in 1790 on a tour of Long Island, and it was most likely a young tree when the Dutch East India Company sent a group of Walloon families to Manhattan in 1624.” Perhaps its longevity through the ups and downs, the tragedies and celebrations, the storms and weather changes can give us some hope, optimism, and beauty in these difficult times. Have you noticed cascades of small 5-lobed white, pink, or even sometimes magenta blossoms on trees in your backyards, parks, and gardens? Spring is here along with the blooming of the flowering crabapples, Malus floribunda. Riverside Park, the park closest to me, is filled with the delicate blossoms crabapples and cherry trees, both members of the Rosaceae or rose family. You can tell the crabapples by their bark with its vertical fissures. 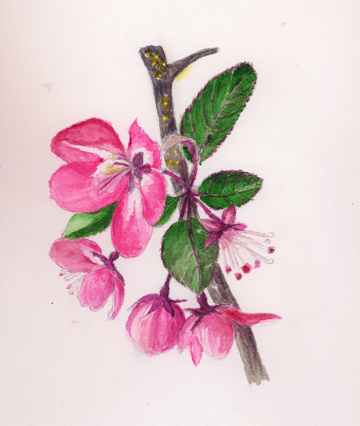 If you get close to the blossoms, you will see that crabapples bloom in clusters of five and the blooms do not all open at the same time as you can see in my drawing—one has already dropped its petals, one is wide open, and the others are about to pop. If you remember where the crabapples are in your area, you will find the small apples in the same clusters of five—some will be red, some yellowish, and some close to rust colored in the early days of autumn unless the birds and squirrels have already feasted on them. The Crabapple Grove in Riverside Park and the crabapples in the Conservatory Gardens of Central Park as well as the Bruckman Crabapple Collection in the New York Botanical Garden are part of New York City history. Many of them were planted in the 1930s and 1940s as part of the parks’ beautification projects under the federal Works Progress Administration under then Parks Commissioner Robert Moses. What makes these crabapple trees special is their low hanging, gnarled, craggy, and multi-branched shapes, probably unlike more recently planted crabapple trees with their single stem (trunk) and higher branches. The Riverside Park and Central Park heritage crabapples call out to artists and photographers and perhaps to poets as well. By the way, I read that similar trees were planted in Clove Lakes Park and Silver Lake Park in Staten Island. Sounds like it Is worth a trip to see them. Let me also tell you about the so-called walking crabapples of the Brooklyn Botanic Garden. 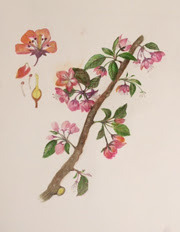 In Alec Baxt’s article, he writes that in 1911 the second year of the Brooklyn Botanic Garden, “a showy crabapple was planted on what was then called Rose Family Hill, a grassy slope just west of the lily pools. In the century that followed, the tree’s limbs twisted upward, and even more so, outward.” And here’s what happened next, the branch that had grown toward the ground and outward had rooted fifteen feet away. The original branch had weakened and crumbled in part, but a new tree had rooted itself and ultimately became a freestanding tree. Baxt asks his readers: “When new growth takes off from old rooted branches, has an old tree become young again? Is it the same tree or a different one entirely?” Hmm. Trees offer us not only shade, beauty, and food, but they also may cause us to stop and pause and think. We celebrate our planet Earth today. We see the connection of all the life forms in it. Each of us can play a role in the health of our Earth. Thinking about this led me to look at a an area of environmental science that I knew little about: phenology (not phrenology, the pseudo science of bumps on the head). Phenology measures the timing of cyclical biological events of all living things. It includes observing periodic plant and animal life cycle events and how they are influenced by seasonal change, climate variations, habitat, elevation, and weather itself. The study includes tracking the timing of leafing out of plants, the emergence of flowers, the arrival of migrant birds, and the emergence of insects. We count on scientists to let us know about climate changes and dangers, and they have sophisticated tools like remote sensors on orbiting satellites like the Advanced Very High Resolution Radiometer (AVHRR) and the Moderate-resolution Imaging Spectroradiometer (MODIS) that calculate amount of green vegetation and they have found that their satellite data match ground observations. Still those of us on the ground need to pay attention too. There have always been individuals who in their own small area collect important data about the health of their environment. For example, Henry David Thoreau compiled his own data set of the leaf out of trees in Concord, Massachusetts in the mid-nineteenth century. I remember when we had a house in New Paltz how descendants of the Smiley family measured the waters in the Shawangunk ridge as well as noted leafing and other natural events in the Mohonk region over many decades and this work is continued by the Shawangunk Ridge Biodiversity Partnership. Each of us can take an interest in an area near where we live. As part of Earth Day, it is a good project to go outside and notice the trees that are beginning to leaf out in your area. In fact, a friend of mine has a young tree-loving son who is keeping a notebook with dates for when trees begin to leaf out in Forest Hills where he lives. In Riverside Park, the Callery pears, the redbuds, crabapples, and kwanzan cherry trees are beginning to bloom, and soon they will leaf out. Birds are building nests and insects will emerge. Spring will come. “Tree roots extend a long way, more than twice the spread of the crown. So the root systems of neighboring trees inevitably intersect and grow into one another…usually there are fungi present that act as intermediaries to guarantee quick dissemination of news. These fungi operate like fiber-optic internet cables…The fungal connections transmit signals from one tree to the next, helping the trees exchange news about insects, drought, and other dangers. Science has adopted a term first coined by the journal Nature for Dr. [Suzanne] Simard’s discovery of the `wood wide web’ pervading our forests” (10-11). Wohlleben was originally a forester who was involved in chopping down forests and replanting them for industrial purposes. He questions what he used to do and has become a forest advocate and an above ground voice for the trees. He tells us, “Trees live their lives in the really slow lane, even when they are in danger. But this slow tempo doesn’t mean that a tree is not on top of what is happening in different parts of its structure” (4). He does suggest that trees can mount their own defenses, but these days they may need some help from us. Earth Day is a good day to think about that. As Jane Goodall says, "Every single individual makes some impact on the planet every single day. And we have a choice as to what kind of difference we are going to make." “Feathers: Fashion & The Fight for Wildlife” on view at the New York Historical Society from April 6-July 15, marks the centennial of the Migratory Bird Treaty Act (MBTA) of 1918. The exhibit presents examples of the use of feathers and actual birds in decorative wear. The widespread use of feathers for decoration led to the MBTA legislation which prohibits the hunting, killing, trading, and shipping of migratory birds, their feathers, and their eggs. Since its passing, the MBTA has been administered by the U.S. Fish and Wildlife Service whose power extends to the regulation of the commercial plume/feather trade, a thriving trade in the early 20thcentury that by 1918 had already decimated the population and in some cases led to the extinction of many American bird species. The restrictions had a huge effect on New York City, which--as the US fashion capital-- was the center of the US feather trade producing hats as well as other clothing, decorative items, and ephemera constructed of feathers. The exhibit honors activists like George Bird Grinnell, the founder of the Audubon Society; Olive Thorne Miller, Lilli Lehmann, Florence Merriam Bailey, Mary S. Sage, and Mabel Osgood Wright who worked to ensure the passing of legislation protecting birds from slaughter and suggested that people respect the lives of birds and instead use ribbons and flowers to decorate their clothing and homes. 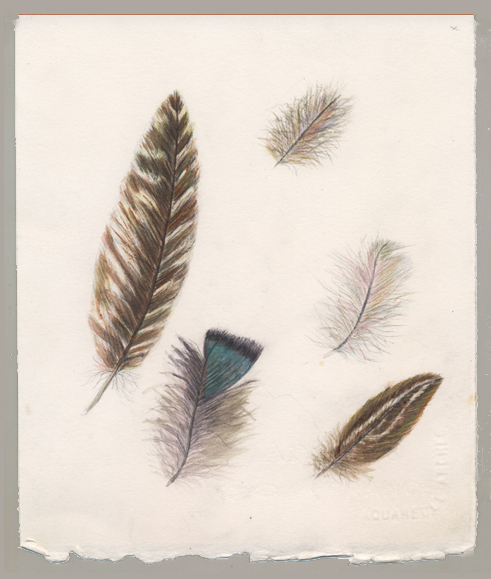 I took a course with Mary Christiansen at the NYBG in drawing feathers. She was careful in obtaining feathers from hunting websites where feathers and even wings of game birds are legally sold to help teach dogs how to hunt. These feathers helped me as an artist to learn the structure of a feather. Just as with eggs, all feathers are not the same. Some grow in tracks for the wings or the body shape. Some are downy and keep the bird warm or cool. They serve different purposes for the bird. 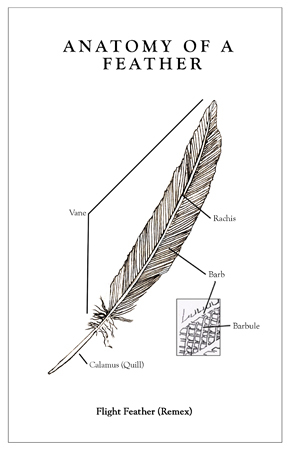 See the structure drawing to see the parts of the feather—all feathers from the largest to the tiniest, from the stiffest to the fluffiest have the same basic structure. Drawing them is a challenge. It is important to capture the softness as well as maintain the structure of feathers in addition to the colors, textures, and shapes. Part of drawing birds as well as drawing feathers is to attempt to make them appear light yet solid, strong yet delicate. Drawing feathers, eggs, and birds themselves for me and this blog is a way of reminding myself and any reader of how vital each of these small lives is. And reading about these activists show us how important our role can be in making sure that their lives are protected and valued. Yes, “hope” is the thing with feathers, but at this time in history, we may need to do more than hope to ensure that the 1918 MBTA and other conservation measures are supported and continue their important work. Oology! It's a very special day! Today is Easter Sunday, Passover, Palm Sunday for Orthodox Christians, and April Fool’s Day—a rare confluence of events. It is also the day after a blue moon, which is a second full moon in a month such as occurred in March 2018—on March 1st and 31st. Our next full moon is April 29. Thinking about the roundness of the glowing moon draws me to the subject of this post—eggs or the study of eggs--oology. Eggs, dyed colorful eggs, are a part of the tradition of Easter and many other religions at spring time. Eggs symbolize life, fertility, spring, and the future. They are a tiny piece of hope. In the Christian religion, they are meant to symbolize Jesus emerging from the tomb and being resurrected—in a sense breaking through the seal of the shell and coming back to life. Drawing eggs, like the 90 plus eggs I drew for The Field Guide to the Neighborhood Birds of New York City, was a lesson in close observation of something that we may think of as simple or not think of at all but which in fact contains a mystery. People dye eggs for holidays, but wild birds do it by themselves. For despite what we think, wild bird eggs are not all white, not all ovoid, and not all the same size as you can see in my drawing. Wild bird eggs range in color from the white or brown we know from the supermarket and the turquoise we know from robin’s eggs to a rainbow of greens, reds, oranges, blues, tans, beiges, and even black. It is also interesting that eggs that look white to the human eye may have bolder colors under ultraviolet light, which helps birds identify their eggs. Birds’ eyes are tetrachromatic—they have four photoreceptor cells so they see not only the colors we do but also in the ultraviolet range, which we do not. Calcium carbonate produces the white color of the shells while biliverdin produces the blue and green colors and protoporphyrin produces the yellow, red, brown and orangey colors. The two pigments together can make purples and exotic greens. Eggs come in lots of shapes. Oval-shaped eggs are the most common, but many owls lay completely round eggs. Shorebirds lay pointed pear-shaped eggs perhaps preventing them from rolling away thereby keeping them in place in the nest. Some of the colors along with squiggles, specks, splotches, and streaks may help to camouflage the eggs so that predators do not steal them. Wild bird eggs are very attractive to squirrels, rats, reptiles, and snakes as well as to other birds and for good reason. Eggs are rich in good nutrients as many of us already know. Bird eggs are amniotic, which means they have a hard shell with a porous membrane for the exchange of oxygen and carbon dioxide. The yolk is the part with the fat and protein that nourishes the growing chick. The shell is rich in calcium and parent birds will often eat the empty shells from their own chicks to both replenish the calcium in their body and to protect the nest from predators who might spy the shells. Bird eggs range in size from the hummingbirds with the tiniest eggs to the ostriches with the largest eggs. 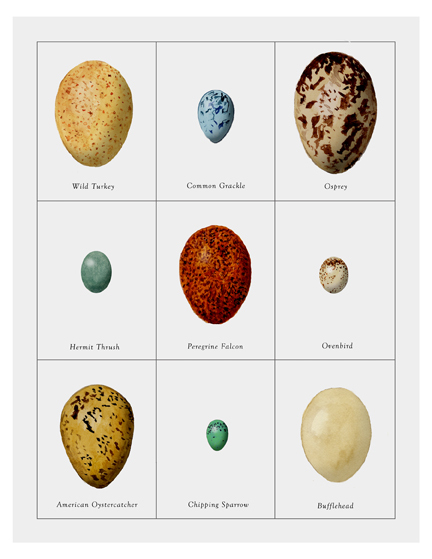 There was a time when humans collected wild bird eggs for their beauty and value, but it is not legal to do so anymore, so we have to admire them in museums and books. In fact, we need to discourage the removal of eggs from nests no matter how beautiful they are. Many formerly common bird species are at risk from predators, even our beloved cats, and from environmental change. The best thing we can do for the birds we love is to look, wonder, and ooh and aah about the mysteries contained in the shell, the nest, and the birds that hatch. Trudy Smoke is a professor of linguistics and rhetoric at Hunter College, CUNY. She is also a nature illustrator who studied at the New York Botanical Gardens.